I’ve always loved the Christmas season. The magic and wonder of a time where it seems the whole world is full of joy and love always makes me all warm and fuzzy inside. To quote one of my favorites, Home Alone, “Christmas is the season of perpetual hope” and what a precious season it is. With Christmas comes so much joy and yet for many, Christmas also brings sadness. Stress. Resentment. Loneliness. For many this has been a tough year – financially, psychically, spiritually – and who wants to reflect on all that when the rest of the world is singing Christmas carols and Instagramming pictures of perfect Christmas trees? Everywhere you turn it’s doom and gloom, shootings and sickness, political feuds and people letting people down. Sometimes life robs us of our joy… but joy is a choice. This Christmas season I choose joy. The little and ginormous blessings. Quiet mornings with a cup of coffee. Precious memories of those who have gone on before us. 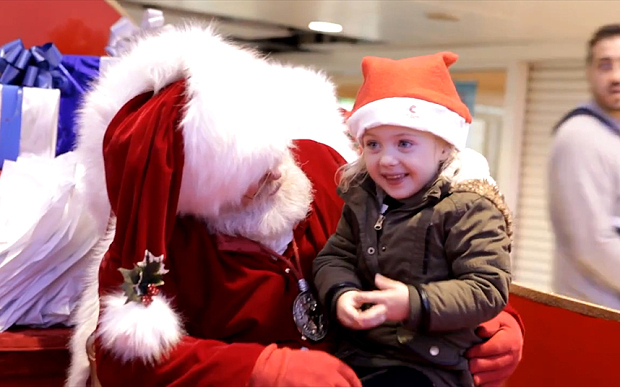 Santa who goes above and beyond to make the day of a child. A smile and a “Merry Christmas” from a complete stranger. Sure, we can choose to live in an attitude of worry, fear or anger or we can choose to pursue the joy that Christ gives! When our focus turns to gratitude, we find true joy that lasts long after the Christmas cookies are all eaten.